Adding an ankle load during treadmill walking significantly improves gait kinetics in children with Down syndrome (DS), possibly due to greater contributions from the ankle plantar flexors, according to a study from Georgia State University in Atlanta. Jianhua Wu, PhD, assistant professor of kinesiology and health at Georgia State and coauthor Toyin Ajisafe, a graduate student, investigated effects of walking speed and external ankle load on the kinetic patterns of treadmill walking in preadolescents with DS and a comparable group of typically developing children. 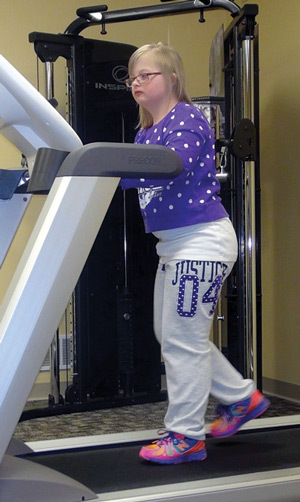 Ten children with DS and 10 typically developing children (eight boys in each group; average age 9 years) participated in treadmill tests performed at two speeds (75% and 100% of preferred walking speed) and two ankle-load conditions (no ankle load or with ankle loads equal to 2% of the participant’s body weight). The added ankle load, applied using 1.25-lb weights from a sporting goods store, was intended to create a 39% increase in the moment of inertia for each leg at the hip joint. The researchers instructed children to walk on the treadmill without placing their hands on the handrails, and provided verbal encouragement to the children with DS as needed during the tests. The researchers used a seven-camera motion capture system to collect kinetic and kinematic data, but, for this study, analyzed only the kinetic data. Compared with the typically developing children, the children with DS had a shorter duration of propulsion during push off, a smaller second ground reaction force (GRF) peak and vertical propulsive impulse, a higher loading rate, and a lower unloading rate. The magnitude of the second GRF peak in the children with DS was smaller than body weight, a characteristic that is associated with typically developing children at younger ages, who tend to use the hip extensor muscles during push off rather than the ankle plantar flexor muscles. Walking at a faster speed helped the children with DS improve the duration of propulsion, vertical propulsive impulse, and unloading rate, but the second GRF peak actually decreased further. However, the added external ankle load helped increase the second GRF peak as well as the vertical propulsive impulse, suggesting that the weights helped the children engage the ankle plantar flexors even at faster speeds. The findings were published in January by Gait & Posture. “Inclusion of external ankle load may be a promising approach to strengthening leg muscles and eliciting a more powerful push off in persons with DS,” the authors wrote. This could help children with DS on more than a physical level, Wu said. “A higher level of motor capability will certainly get children with DS more engaged in physical activity and sports. This may benefit children with DS not only at the physical health level, but also at the psychological and mental levels,” he said. Kathryn Martin, PT, DHS, professor and Doctor of Physical Therapy program director at the Krannert School of Physical Therapy at the University of Indianapolis in Indiana, said the study highlights one possible way to improve strength and increase physical activity in children with DS. “In my opinion, we cannot correct hypotonia or ligamentous laxity, but we can improve strength. Improving strength should help minimize compensations. Adding ankle load is one way to improve strength,” Martin said. However, she noted that the effective use of treadmill technology in this patient population may be challenging for some clinicians. Wu J, Ajisafe T. Kinetic patterns of treadmill walking in preadolescents with and without Down syndrome. Gait Posture 2014;39(1):241-246. I have also noticed that children with Down syndrome also have severe flat feet. While visiting my husband’s office I would observe his patient’s with Downs and see their gait abnormalities. 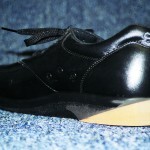 Many of his patients would receive an orthotic which seemed to improve their walking. Wondering if combining orthotics with weights would improve their function even more.